The way the Internet is designed and operates favors criminals and puts all of us at risk. It is remarkably easy to deceive and harm others online. Criminals can register domains (website names) with fictitious information, create malicious websites, and misrepresent themselves thanks to the lackluster governing organization called ICANN and its many reseller minions. ICANN is the Internet Corporation for Assigned Names and Numbers with offices in Los Angeles, Washington, D.C. and other places around the world. In their own words ICANN says that they are “an internationally organized, non-profit corporation that has responsibility for Internet Protocol (IP) address space allocation, protocol identifier assignment, generic (gTLD) and country code (ccTLD) Top-Level Domain name system management, and root server system management functions.” Simply said, they are the folks who make and enforce the rules for creating virtual worlds online that we all use in our digital lives. This is just one small story about an unidentified criminal group that is manipulating the Internet system because they can. 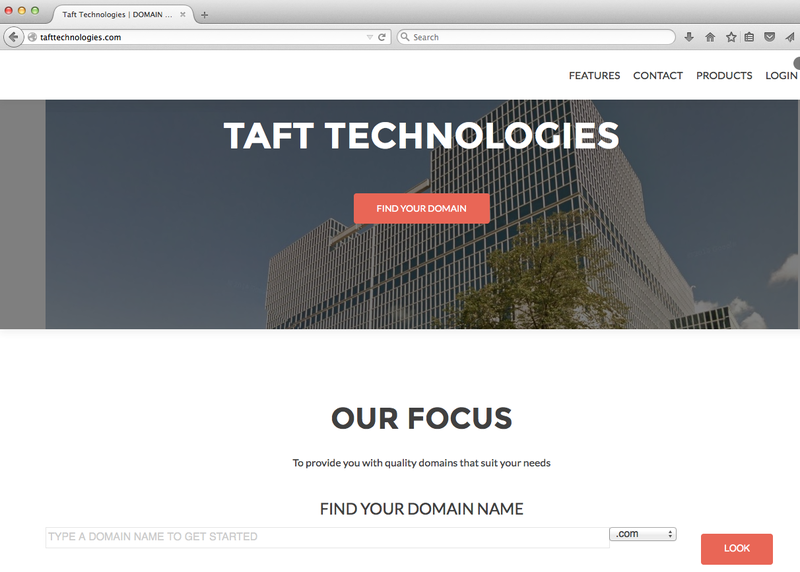 Their front name is Taft Technologies but who they really are is impossible to say. 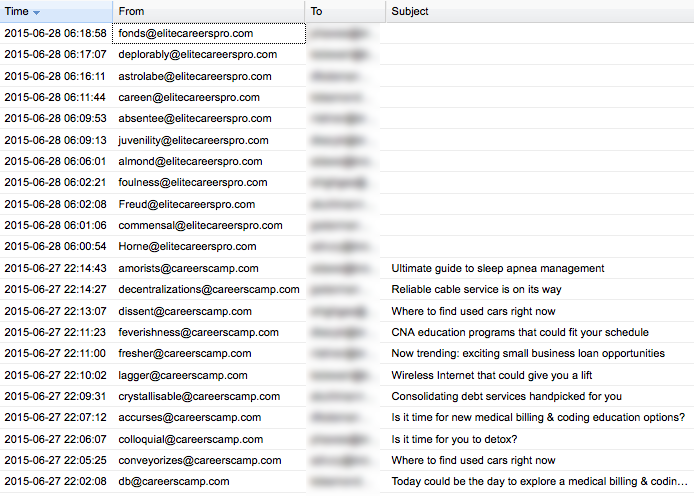 On June 27 and 28 TheDailyScam.com collected many scam emails from its honeypot email servers that seemed to come from different email addresses of the domains careerscamp.com and elitecareerspro.com. The email above with the subject line “Reliable cable service is on its way” says that it is associated with www.business.com, a legitimate business, but this is simply not true. None of the links point back to business.com. Nor is it true that the email is associated with the company and address listed at the bottom of the email as “Gold Consultancy, 3005 Macbeth Creek Drive, Charleston, SC 29414-7146.” A search for this address on Google shows a residential home as well as many other links to fake emails that seem to be connected to a website called email-fake.com. Were you aware that you can create fake email addresses that exist for only a short period of time and then disappear? If you need to send an email from a fake email account, no problem. There are many to choose from besides email-fake.com such as fakemailgenerator.com, deadfake.com, fakeinbox.com, stop-my-spam.com and others. 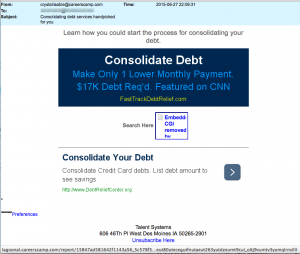 We also found the exact same lies about the website and company “Talent Systems” displayed in the second email with the subject line “Consolidating debt services hand picked for you.” We checked with Google to see what it could tell us about careerscamp.com and found nothing. 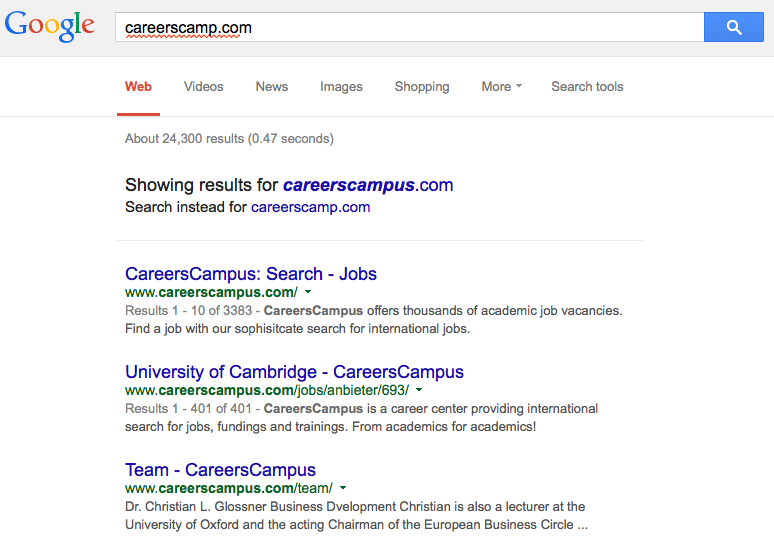 To Google, careerscamp.com didn’t exist. Google did find the other domain, elitecareerspro.com, but Google displayed very strange information for that website and the link to it didn’t work. Feel like your headed down a rabbit hole yet? We’re not done yet. 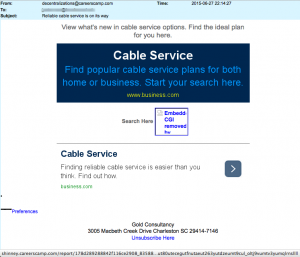 On June 29 we saw another burst of scam emails from the domain extendfurther.com. Each scam came from a different username and with different subject lines. Take a look at the three sampled scams below and you’ll know why these scams caught our attention. All four domain registrations (the three scam domains plus Taft) show the contact person as James Edwin of Taft Technologies in Wilmington, DE. The email for James is listed as jamesedwin@yandex.com. For those who don’t know, Yandex.com is a Russian Internet company that also provides free email services. A Google search for James Edwin and Taft Technologies together turns up nothing. 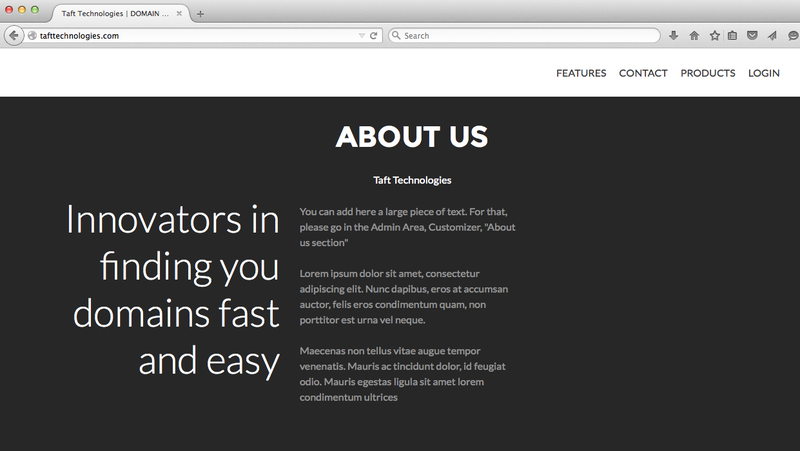 But let’s examine their website, TaftTechnologies.com. The building shown on their website is called the “Hercules” building located at 1313 N. Market Street in Wilmington, Delaware. This was confirmed for TheDailyScam by Jessica Bell of McConnell Real Estate Agency in Wilmington. McConnell Real Estate Agency represents the building owner in real estate transactions. Ms. Bell confirmed that there is no such business called Taft Technologies renting suite 206, or any other suite at that address. A call to the phone number listed on their website, and listed in the WHOIS information, leads to a recording of a woman asking the caller to leave a message. You can listen to it here. On the one hand, someone has gone to a lot of trouble to make people think that Taft Technologies is a legitimate business. And yet their About Us web page on June 28 looks like it was never completed. It’s as if they forgot to fill in the information. I have taken a look on TaftTechnologies.com I did not find any information that they mentioned they are a Registrar on their website and their website does not seems to be ready yet. If you wish to register a domain name with an accredited Registrar. Please refer to the list of accredited Registrar via this link. It’s important for our readers to understand that these responses are coming from the Global Domains Division of the company tasked with making the rules that govern Internet names and the sale of those domains, and for policing and monitoring that the domain resellers play by the rules, assuming there are any rules. We called Enom and spoke to Derek in tech support who said that Taft Technologies was actually registered to one of Enom’s reseller’s called Namecheap.com. Are you still following this crazy spiral? It had us feeling as though we were chasing our tail. 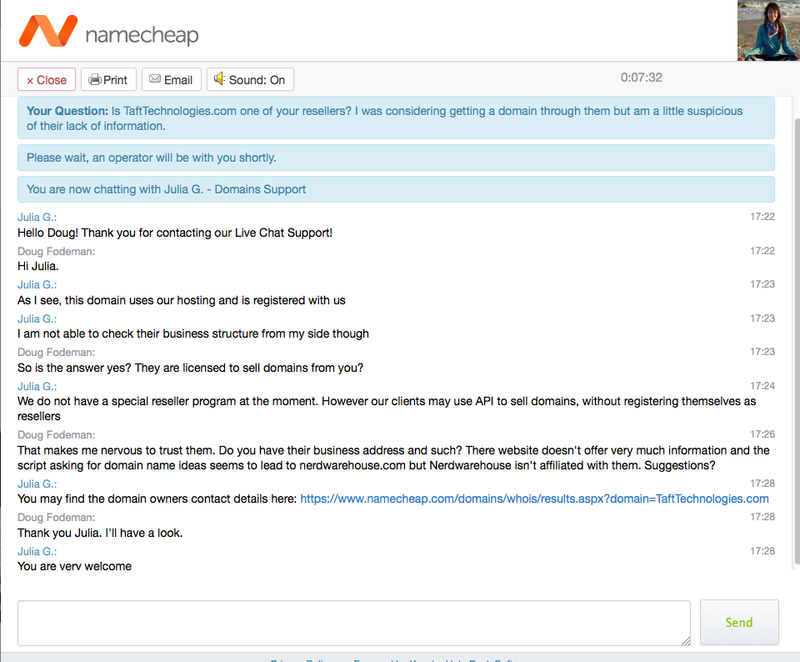 We contacted Namecheap.com’s tech support through a chat window. Can you guess what their response was? So who is Taft Technologies? They are just another criminal enterprise successfully preying on the rest of us because ICANN and the domain reseller system cares more about making a buck than it does for protecting citizens of the Internet.